This day board the Volvo bus from Delhi to Manali in the evening. Overnight journey in the Volvo bus. 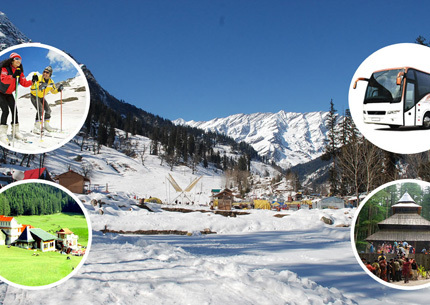 Arrive Manali in the morning, check in the hotel and after having some rest proceed to local sightseeing of Manali like Hadimba Devi Temple, Vashist Village, Club House, Manu Temple, Monasteries. Evening free to visit Mall Road. Dinner & overnight stay at hotel. Morning after breakfast proceeds to full day sightseeing of Kothi Gorge, Gulaba, Marhi, Rohtang Pass (Snow Point). Dinner & Overnight stay at hotel. Morning after breakfast proceed to full day sightseeing of Kullu Valley, Kasol Valley, Rabbit Farm, Shawls Factory and Manikaran. Dinner & Overnight stay at hotel. Morning after breakfast proceeds to Shimla by Deluxe Bus. 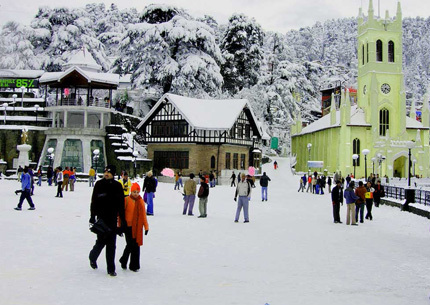 Arrive Shimla by Evening and check in hotel. Evening free to visit Mall Road, Ridge, Church, Lakker Bazar. Dinner and overnight at Shimla. Morning after breakfast proceed to full day sightseeing of Green Valley, Mini Zoo, Wild Flower Hall, Chini Banglow, Faggu Valley view, Kufri, Indira Gandhi tourist park, Fun World etc. Dinner & Overnight stay at Hotel. Morning after having breakfast check out from hotel and catch the Volvo for onward journey to Delhi. The Package Cost Does Not Include Any Airfare And Train Fare. Entrance Fees, Guide Charges And Travel Insurance. 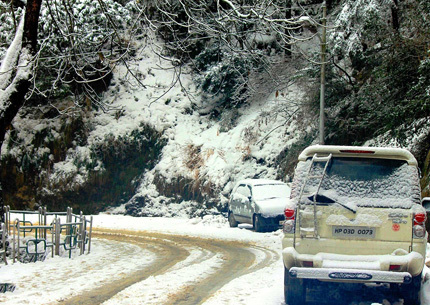 Snow Vehicle Fare, If Road Is Block Due To Snow. Personal Expenses Such As Laundry, Luggage Charge, Telephone Calls, Room Heater Charges, Tips & Gratuity, Camera Fee, Mineral Water, Soft & Hard Drinks, Adventure Activities. Any Cost Arising Due To Natural Calamities Like, Landslides, Road Blockage, Political Disturbances (Strikes), Etc. To Be Borne By The Guest. Package cost does not valid during long weekend, National Holidays, Black Out Dates, X-mas , New Year & season time(From 10th April to 10th July). Copyright © 2017 HTG. All Rights Reserved.